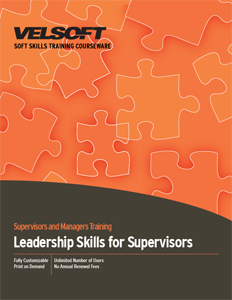 Seeing is Believing This sample manual to teach Leadership Skills for Supervisors is in MS Word format. This one-day leadership skills course focuses on communication, coaching, and conflict: three key skills that leaders need to be successful. We’ve also included Velsoft’s signature leadership assessment tool to help participants gain some insight into their own preferences. These customizable leadership training materials include instructor materials, student guides, marketing resources, and much more. You can even combine it with our eLearning course to create a blended-learning experience. Contact one of our training consultants today to discuss how we can help grow the leaders in your workplace.